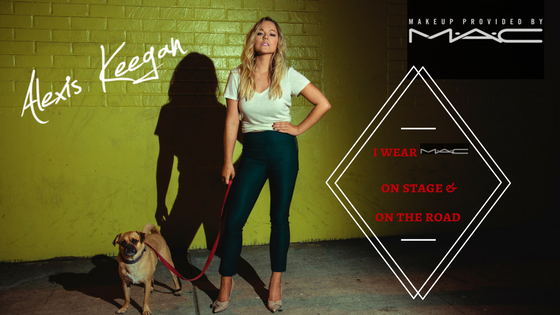 So excited to be supported by MAC Cosmetics on stage and on the road! crazy to have my favorite makeup company ever support me on stage & on the road. Thank you MAC Cosmetics so much! I am honored. The deep R&B grooves emerging in Alexis Keegan’s latest soulful tracks have their roots in the multi-talented singer/songwriter’s teen years growing up in Maplewood, New Jersey. At age 12, her father’s cancer diagnosis inspired her to create a recording of Mariah Carey’s “Butterfly” in tribute. During this challenging period, she vowed to use her vocal skills as a way to help others get through their everyday struggles. During her early years at Columbia High School–alma mater of R&B great Lauryn Hill–Alexis had an opportunity to showcase and develop her vocal power when she became the only white singer in the school’s MLK Gospel Choir. Despite never having sung in an ensemble before, she was chosen as their lead vocalist. Her early development as an artist included work with Robert “Kool” Bell from Kool & The Gang, his wife Sakina Bell, and their son on various musical projects. Later, while studying mass communications at LaSalle University in Philadelphia, Alexis would take off on Thursday and head up to New York City to do some recording with Jay-Z’s nephew’s crew, NBH, then hightail it back for her class late Friday afternoon. As a live performer, she has toured and opened for Ron Pope, Howie Day, Lee DeWyze, Kate Voegele, Tyler Hilton and O-Town, as well as appearing at numerous American Cancer Society “Relay for Life” events in memory of her father. Her still-developing career as an indie artist already includes two popular EPs (Clean Slate and Endless Road), a #1 most added track by an independent artist at indie radio (“Worry No More”), a Hollywood Music in Media Awards nomination, and multiple LA Examiner Music Critic Awards. Columbia High School Martin Luther King Jr. Gospel Choir-Newark, NJ Metropolitan Baptist Church-"The Battle Is The Lord's"